Union Dale, PA – Robert Frost dryly quipped that “good fences make good neighbors.” Apparently the same cannot be said for gates. 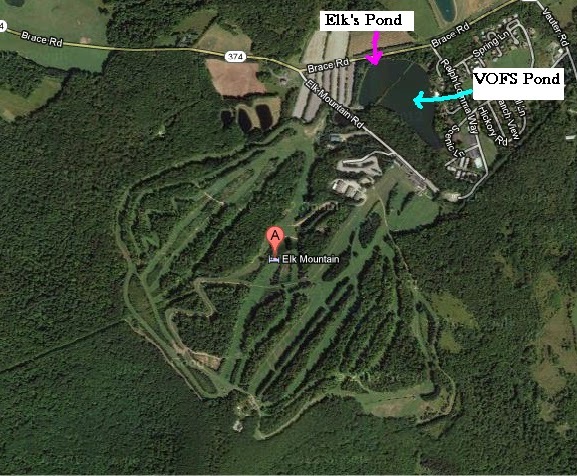 A long-simmering dispute between Pennsylvania’s Elk Mountain and neighboring Village of the Four Seasons (VOFS) boiled over in December of 2011 when, purportedly in response to Elk’s closing of a gate between VOFS and the resort, VOFS sued Elk for drawing water from a shared pond. According to a story published in the Scranton, Penn. Times-Tribune, a judge has finally ruled on the controversies and Elk Mountain came out on the short end of the stick. The lawsuit centered around an interconnected watercourse from which Elk drew water for its snowmaking system. As shown at right, Elk’s four-acre snowmaking pond is connected to a larger 10-acre pond owned in whole by the Village of Four Seasons, a residential community near the base of the resort. The two ponds are separated by a berm which has an opening in the middle that allowed water to flow into Elk’s smaller pond so that the resort could convert the water into snow. 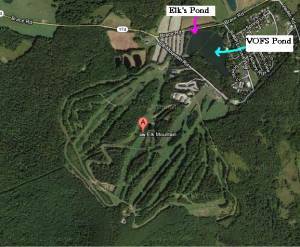 According to the article, Elk and VOFS had an agreement which allowed Elk to use water from VOFS’s pond for snowmaking. At some point in 2011, VOFS terminated the agreement. Elk apparently continued to draw water from the interconnected watercourse. A Pennsylvania judge found this practice violated VOFS’ rights. For now, Elk will be limited to drawing water from its smaller pond. It is unclear what effect the decision will have on snowmaking for winter 2013-14. The small silver lining for Elk was a small one. The court held that it could close the gate and deny direct access to the resort from VOFS. These types of conflicts between neighboring landowners have an uncanny ability to become nasty affairs. However, as both sides continue to jockey for position, a negotiated settlement to the dispute seems the most likely outcome, provided of course that both sides are willing to come to the table. The most significant consequence of VOFS’ victory may be that it significantly strengthened its bargaining position in future negotiations to resolve not only the pond dispute, but also other long-standing issues resulting from the subdivision of the property. Author David B. Cronheim, Esq. is the Chief Legal Correspondent for First Tracks!! Online, an attorney at Norris, McLaughlin & Marcus, PA in Bridgewater, N.J., and author of the ski law blog Ski, Esq. Please feel free to contact the interviewer at DBCronheim@nmmlaw.com.